He's got lifeless eyes, black eyes, like a doll's eyes. First step is to remove the battery cover and remove batteries. That's easy enough. 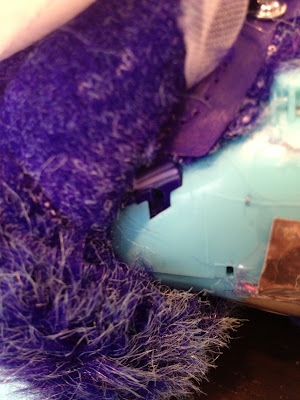 Then remove the screws around the battery tray that hold a retaining clip which keeps the bottom end of the fur in place. Next, start peeling back the fur. Near the tail you'll find a loop attached to a hook. Remove that. Now peel up the fur. 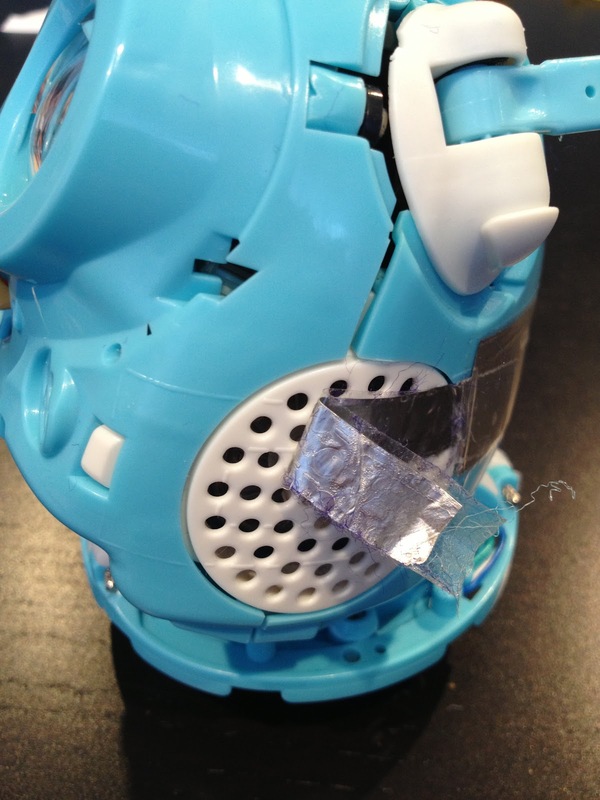 It is clipped in two spots at the back, around the ears and around the face with locking plastic tabs. Locking tab shown with small slot below for unlocking. In most cases, wherever there's a clip, there's a slot below it so that you can insert a small screwdriver and push up on the locking tab and pull out the clip. At the front, after removing two screws holding the fur to the body, insert screwdriver to unlock the tabs, unplug the red wire, and pull the fur up. 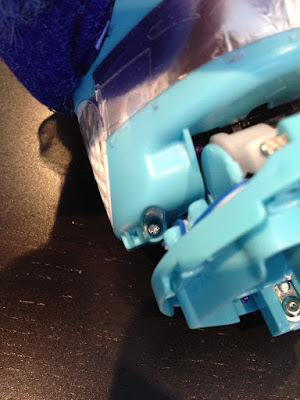 Two screws and two clips in front below face. Remove the red tickle sensor wire. Now pull up the fur to each ear, for which there are two more clips. You'll need to remove the ears first. They are held in by internal clips so you may have to pry, twist, etc. to get them off. One ear of the furby popped right off, the other took more work and came off in two pieces, the actual ear first, which came loose from a glued-in retaining clip (still attached, below). Now, insert screw driver and remove the ear clips. The right top clip can sort of slide out in front of the ear if that's easier. 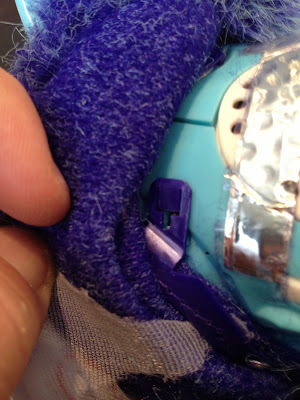 Remove two white plastic covers that go over the ear nubs (shown below). Ear nubs, white ear cover things. Right ear came off in two pieces. The fur is clipped in two spots at each side of the face. Again with the screwdriver to pry the locking tabs out of the way, slide out the clips. There are two more clips at the top above the face. 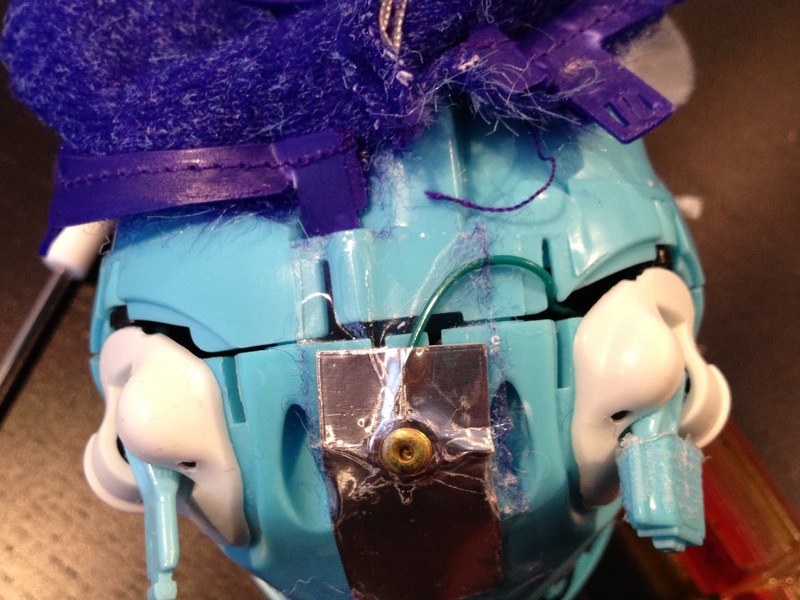 Clips at top of face, clips/ring for ears shown. 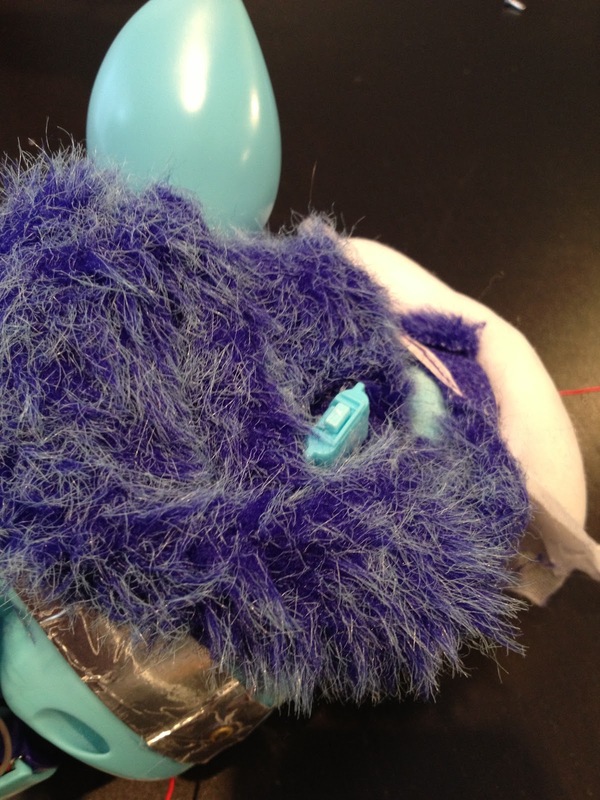 You are now left with this fascinating sight of a Furby without fur. That's not creepy. 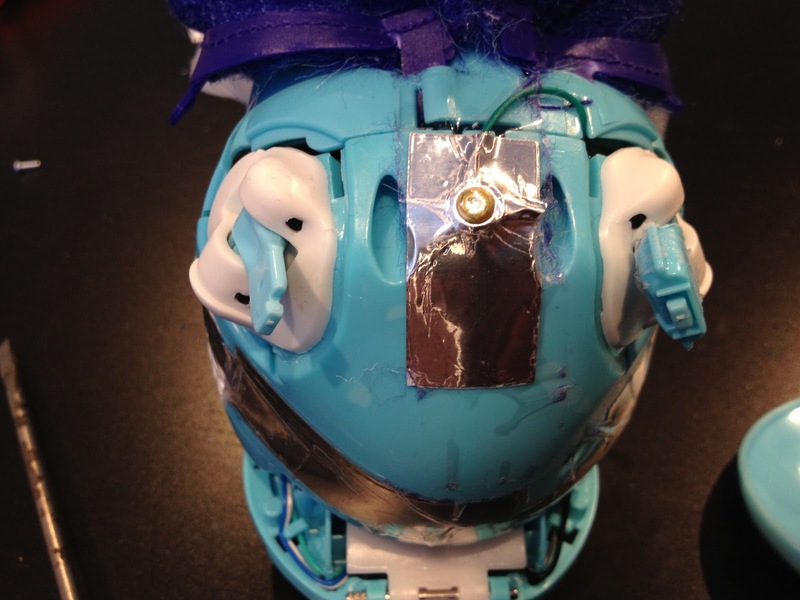 You might as well put the batteries back in so it can talk to you in this skinned state. Fun. I'm not weirded out. Four phillips screws hold the back cover on the Furby. You will probably have to cut through some tape to get to them all. There are two at the bottom on each side, and two at the top near the face clips. Before you remove the back cover, you have to peel back the silver sensors on each side. 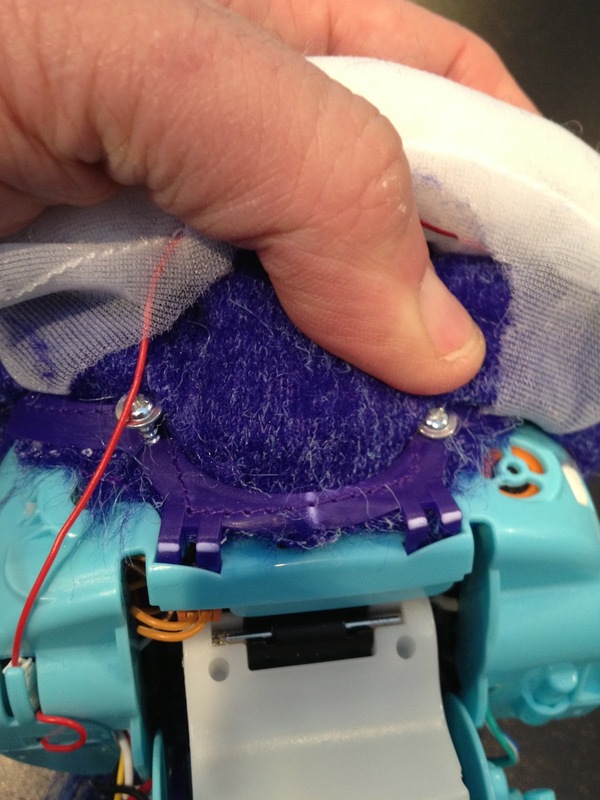 As you have no doubt guessed, the Furby uses these to detect if you're petting its head or holding him or whatever. It's affixed with good old fashioned clear tape. Peel it up with something sharp. You can always re-affix the sensor with packing tape. Right side sensor, peeled back. 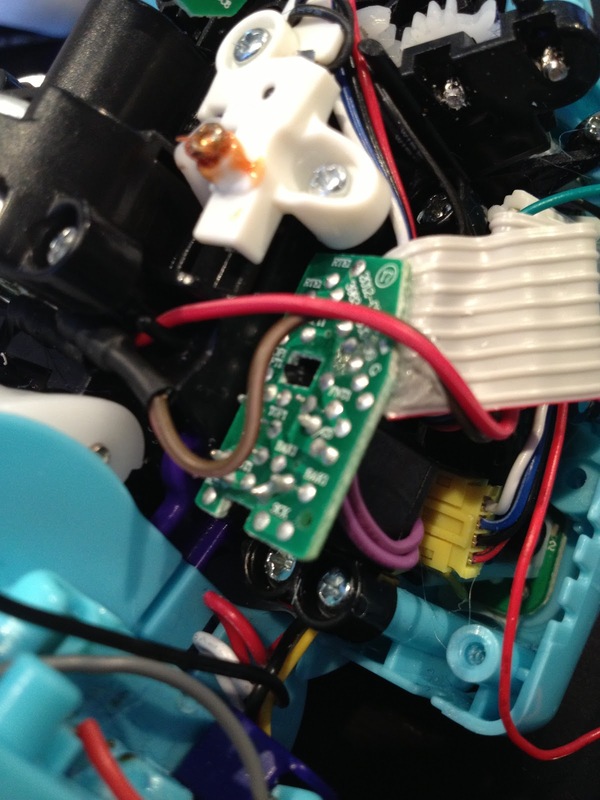 Peel back the left sensor past the white speaker grille, further than shown below. Left side sensor, peel back further than this. Now you can remove the back cover and see what's really inside your Furby. Inside there's an optical encoder board for the eyelids using a Schmitt trigger inverter, plugs for the speaker, and other goodies that I didn't really explore further. Speaker connector and... I'll find out later. I'll find that out later, too. I'll post more details when I disassemble further. 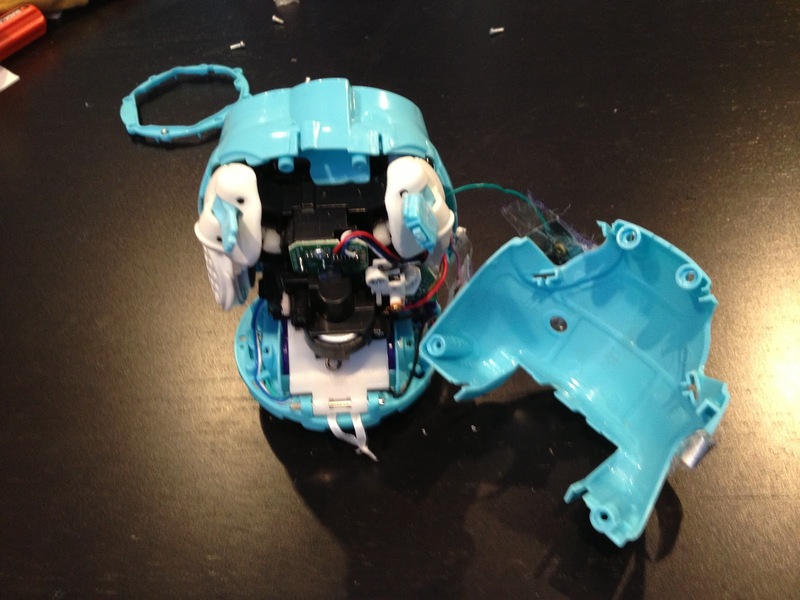 I thought I had the Furby working again but after putting it all back together... I was wrong. And now we have another sick Furby in the clinic. If you find this useful or interesting, I'd love it if you could share it with others. Thanks! Awww how much beautiful it was looking before destruction..!! But however to make a little toy, so much machinery is used..!! Rest assured, it was not destroyed :) My daughter would be most upset if I wrecked her toy. On the contrary I am hoping to come up with a fix for its narcolepsy -- the Furby shuts off randomly then starts back up again. Thanks! My son's has been broken for a few months. This helped me get it running again. P.S. The ears are a pain to work with. Thanks! My son's had been broken for a few months. This helped me get it running again. Hi there, thanks for the question. 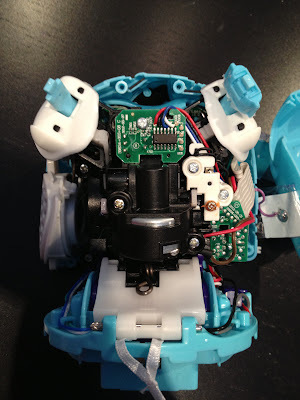 The speaker is internal to the Furby, so you have to disassemble as in the article to get to the speaker plug. 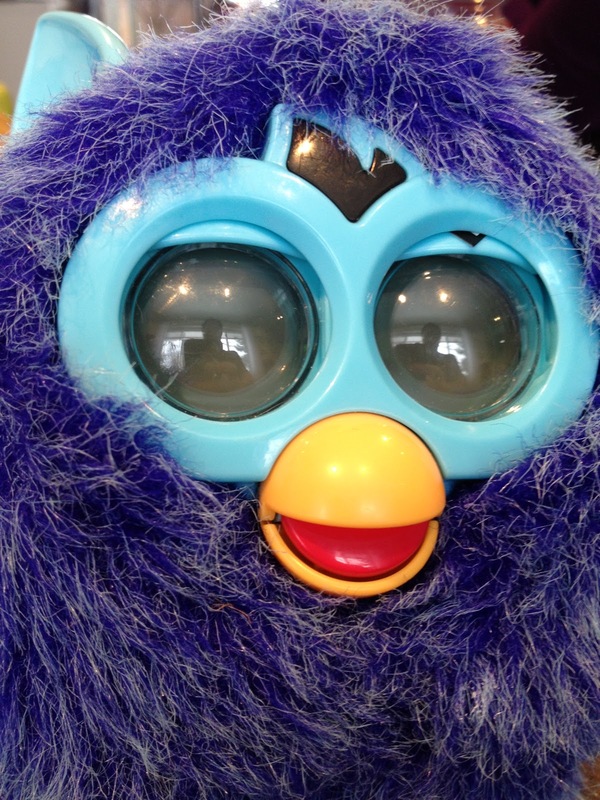 Is it a newer 2012 ish type furby or the older kind from the late 90's? Kcause the speaker and wries for the new ones are tougher to get to, not impossible just time consuming, no handy dandy screws that hold the skeleton together on b these nearly as much, uuuuugh. Which screwdriver for the fur retaining ring on the bottom? I've used your excellent tutorial twice now. The first time I had a very successful repair for an ebay Furby. Once again I've got a Furby as a gift for someone, but there was only sound and eyes, no movements. I found the problem: In your last pic of this post, there's 2 wires, a red and a brown. 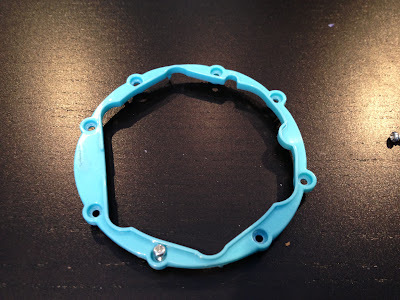 They both end at a circular component, and both are connected to it with a small, silicone-wrapped cylinder, about a 1/4 inch long (I think it's a resistor.) The one on the brown wire snapped off from the solder, but the break is super close to the resistor. I removed the silicone wrap, and found that there's a copper wire wrap along the length of the resistor. 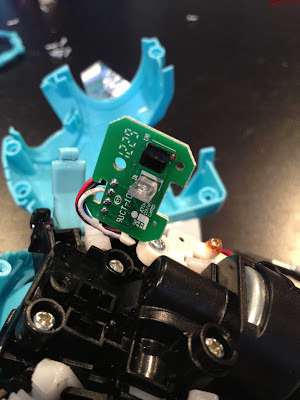 My problem is that I need to simply replace and resolder the resistor, but I have no idea what the part is rated or anything, and I don't want to burn the toy out. I'm hoping you're still answering an occasional question, and that you might have a suggestion for me :) Thaniks! Really awesome you were able to recover a Furby! Glad to hear it. Can you send me an email directly via the "Contact Me" link? I don't remember the part off the top of my head, but maybe after we exchange email you can send me some pics and hopefully we can figure it out. 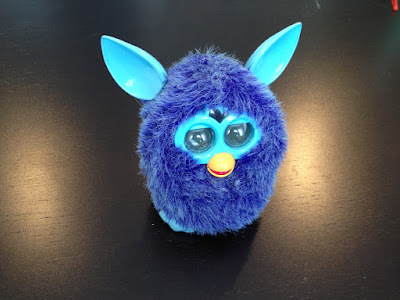 I have a furby boom which is almost identical to this 2012 version. But I'm having trouble in getting the ears to come off. It feels like they're completely glued together. How did you got the ears of? I have the same problem and thus the same question. The furby boom ears seem glued together and I am thinking I might have to resort to cutting slits in the fur so it can slide over the ears. Anyone know if the boom's ears can come off? Anyway it looks like the purple wire next to the brown speaker wire are either theeyes or mouth, i havent played with that board yet so im not sure. Oh and DC fyi, these newfangled fellers still have a sync screw like the older ones. I found this out totally by accident too, thought it was holding that case on too but nope, just wound up making it do the "reset dance". the screw is right about in the middle of the back, and that silver sensor strip would pretty much go right over it except they cut a little bit out and covered it with tape. 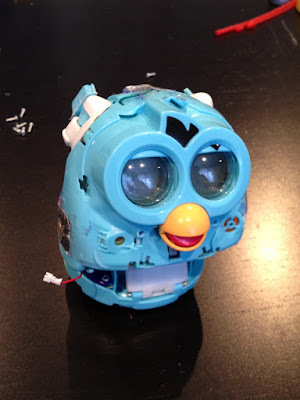 My Furby will work for a while then just die.. any fix for this? I bought Furbacca to replace it.. but I hate to say it im just not impressed with it. Hi, I need some help with a Furby boom. Maybe someone seen something like this before, and can help a bit. A new furby was sent to me, but after the arrival it doesn't move anymore, not the eye lids, not the bottom, ears, nothing. It speaks, the eyes are lighting up but nothing else. The weirdest thing is that in 20 second or so it's shutting down, not sleeping, just shutting down. I tend to remove the fur tomorrow but what exactly am I looking for? The motor, a broken sensor?. I cannot change the toy whith a new one, the person that sold it to me is sending me another one, but I want to do something about this one too. I've seen a video on youtube named furby error, it's another furby with the exact same problem, and nobody knows what to do, they are blaiming the batteries, but this is not the issue on this toy. Thank you! Sorry for the delayed response. 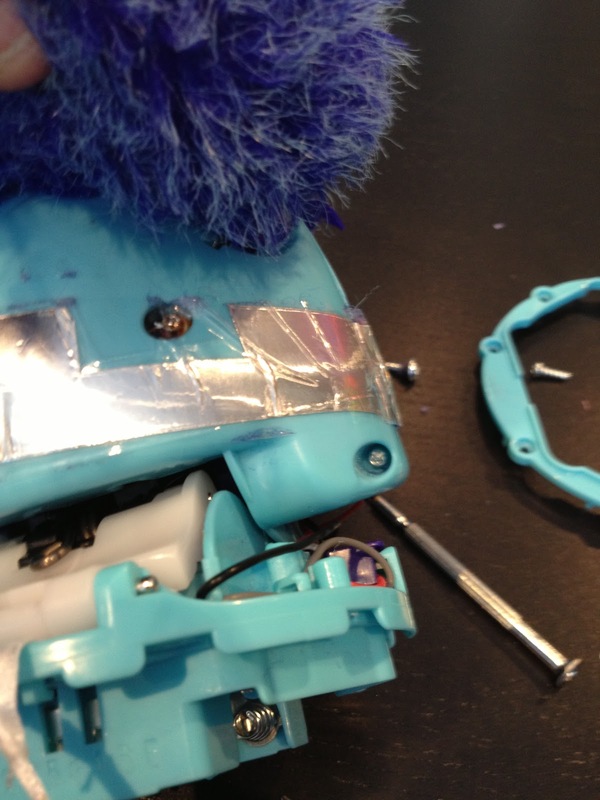 I fixed my Furby Boom. It was the little motor that controlled the movement. I replaced it whith an identical one that I took from an old cd-rom/dvd-rom computer, the one that opens and closes the tray door. It was not easy to change it, but thanks to the pictures above, I finnaly fixed it. 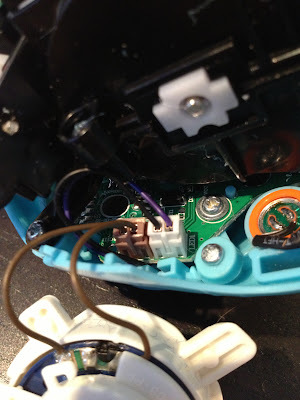 One other problem that I encountered, when changing the little motor, take care that the small plastic piece on top of the old motor, is changed and placed on the new one on the exact position, otherwise it can make the furby vibrate, just pull the little piece up or down untill the vibration dissapears. Another problem that I found is loosing sound from a toy, It's probably the broken speaker. 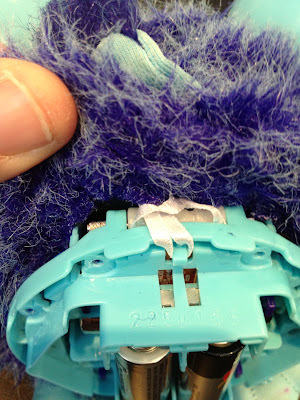 It can be fixed by taking out the fur, removing the old speaker and replacing it with a new one, from a local electronics store. 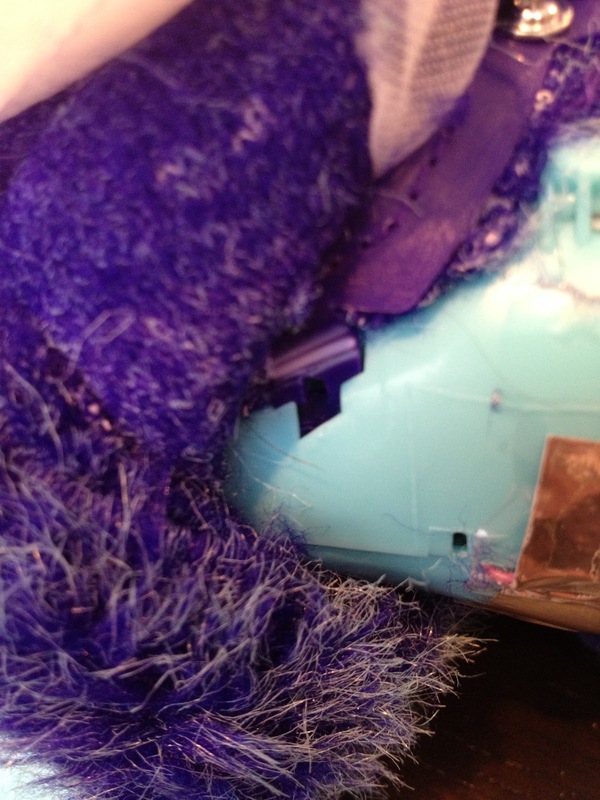 If someone wants to ask me something about fixing Furbys, please contact me on my email: tefe_2006@yahoo.com. I might not know everythyng about them :)... but I would gladly help if I can. Hi, I need some help with a Furby boom. Maybe someone seen something like this before and can help a bit. A new furby was sent to me, but after the arrival, it doesn't move anymore, not the eye lids, not the bottom, ears, nothing. It speaks, the eyes are lighting up but nothing else. The weirdest thing is that in 20 second or so it's shutting down, not sleeping, just shutting down. I tend to remove the fur tomorrow but what exactly am I looking for? The motor, a broken sensor? I cannot change the toy whith a new one, the guy that sold it to me is sending me another one, but I want to do something about this toy too. 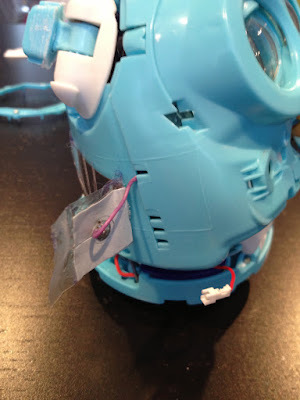 I've seen a video on youtube named furby error, it's another furby with the exact same problem, and nobody knows what to do, they are blaiming the batteries, but this is not the issue on this toy. Thank you! 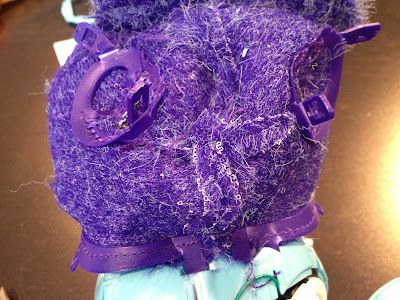 I have a Furby in the exact same condition and a really upset 6 yo daughter. Did you happen to find a solution for this one? My Furby wouldn't move. After skinning and removing back plate I found one of the wires had come off the motor. Just need to solder. Where is the tilt sensor located? 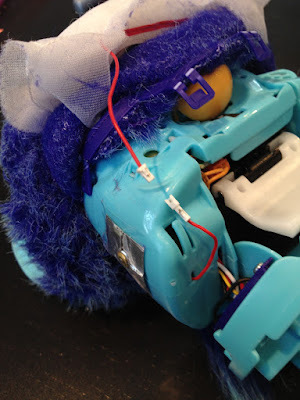 I've got a sick furby boom that has a motor issue and the tilt sensor is malfunctioning. It acts as if it's upside down when it isn't.